In anticipation of my fast-approaching return to the peninsula, I thought I’d put together a list of things I’m doing to prepare. Going back for a second time, it’s nice to know a bit more of what to expect. 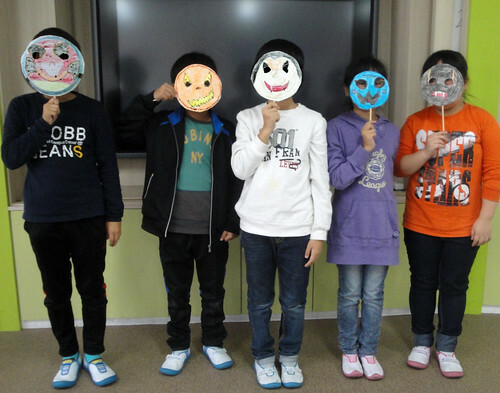 While some of the things below may be a bit me-specific, I figured my list could be of help to any of the thousands of other westerners out there preparing for their year of English teaching in Korea, who happen to find this. Should anyone stumble across this who’s been to Korea or happens to be there now, please feel free to add your suggestions in the comments! Hangeul, the Korean alphabet, only has 24 letters and very few pronunciation exceptions (unlike that other language I know). Do yourself a favor and learn it in advance, so you can read bus schedules and beer menus as soon as you step off the plane. It’ll only take an hour or two, so no excuses. Hyunwoo Sun came to my EPIK Orientation in Seoul in 2010 and blew us all away with a Prezi presentation on Korean culture. I started studying with ‘TTMIK’ shortly thereafter and it’s still my #1 resource. The amount of awesomely helpful material they have available FREE on their website is mind-boggling. Go now! I subscribed to their daily sentence/vocabulary emails nearly 2 years ago and have yet to receive any repeats. Their sentences can be a bit textbook, but the vocabulary is always helpful. They’ve even got audio to help with pronunciation. A word a day can never hurt. 2. Bring these things (especially if you’re a lady). Things may have changed in Ulsan with its recent addition of Costco, but as of last year these were all hard to find and frequently requested in care packages from home. Unless you have a small, narrow foot. My 8-1/2 (US) sized foot was very frustratingly one size too big for all Korean women’s shoes. Should you happen to have a Korean-sized foot, you’ll be able to find street stalls full of cute, cheap shoes in nearly every city. Lucky you. There are plenty of cute bras, but bigger band and cup sizes are in short supply and cheaper to buy at home. Your non-Asian skin tone will probably not be available, unless perhaps you’re in Seoul. However, Korea does have tons of make-up and beauty stores, where you’ll be able to get all kinds of products like BB Cream. 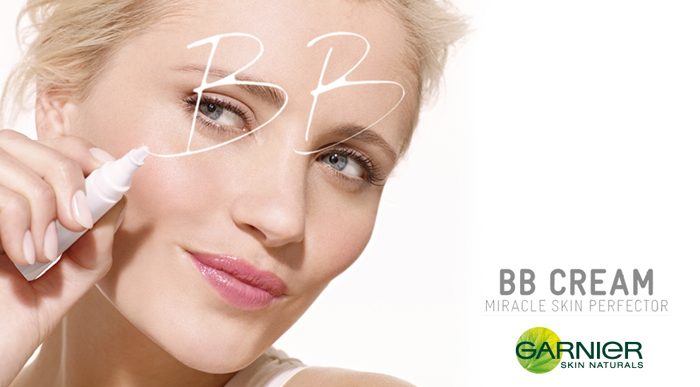 While I’ve never tried it, apparently BB Cream is a thing worldwide, so maybe I should. They’re not very popular, so don’t expect to find many. There’s definitely deodorant available, but nothing I could find that lived up to my sweaty American standards. I’ve heard from a few sources that once you stop wearing deodorant your body will adjust and stop being smelly. I’ve also heard that that’s definitely not true, so I’m not about to test it out for myself. I was almost tempted to put this into the “things not to bother bringing” category, because there are so many cheap clothing stores everywhere, and Seoul has Myeongdong. Ulsan even has a “big size” store for us of non-Korean proportions. But trips to Seoul are expensive, so I’ll be stocking up on jeans and some work clothes before leaving. I will however keep my t-shirt supply minimal as I’m always on the look-out for only-in-Asia finds such as this. Bring pictures of your family, your hometown, and you doing some of your favorite things and your first day of teaching is already set. You are probably going to meet a co-teacher, who will have to do a ridiculous number of things for you to help you get functioning in a foreign country. This is a nice way to say thank you for all the trouble you’re about to put them through. Korean pharmacies are awesome, and doctor visits are super cheap. It’s so prevalent, it’s inescapable. Hiking is extremely popular in Korea, so there’s brand name and rip-off gear readily available. My personal favorites are ‘Red Face’ and ‘Black Face’ but there’s plenty to choose from! Thanks to an obsessive gaming culture, ‘PC bangs’ are on every corner, and you will more than likely have 2-10 that never close within steps from your apartment. They can however be a bit smokey and/or over-crowded with adolescent boys, so I’ll be bringing my laptop. Although not having internet would save quite a bit of money. It is more than likely that you will end up in a ‘noraebang’, or Korean singing room, with all of your co-workers and colleagues within your first few weeks in the country. 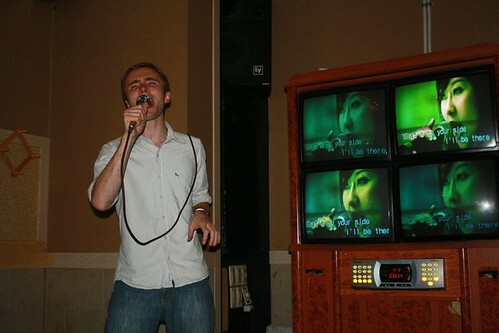 Someone, probably your boss, will at one point give you the microphone and song book and demand a performance. You may as well be prepared. On that same note, you could familiarize yourself with the many rules of Korean drinking. However, as a foreigner no one will expect you to know these anyways. 5. Get your fill of these things before you go, because you won’t be getting them in Korea. 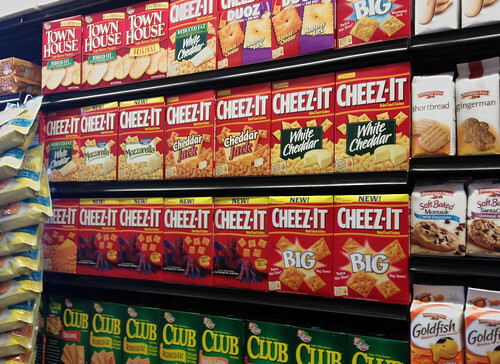 Oh salty, cheesy, non-fish flavored snacks, how I will miss you. While many of these are widely available, they’re generally a bit expensive. $6 for a jar of creamy Jif? No thanks. Ultimately, the best advice I could give to anyone going to Korea for the first time would be to throw any and all expectations you may have out the window. Because anything could happen, and it probably will …at the last second, without any prior warning. Be prepared! 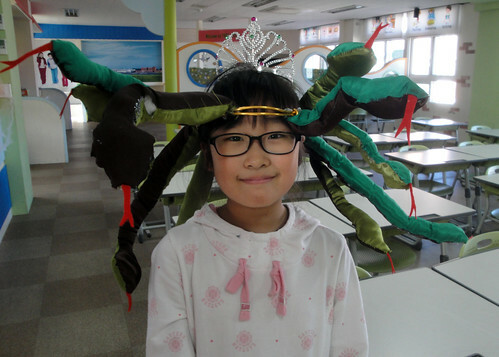 One of my students models my Halloween costume. Can you guess what it is? 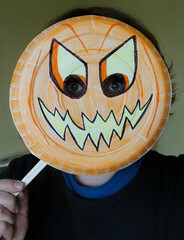 I had meant to write about Halloween before, but apparently never got around to it. Oops! Nothing like some Halloween in January though, right? I never really liked Halloween as a kid, I think because I could never come up with good costume ideas. But then in university I discovered the amazingness that is Halloween in New York, and that I really like to make things, and since then I’ve been all about it. 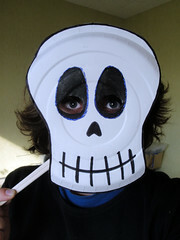 And as far as teaching holidays to my students goes, Halloween is definitely the most fun. 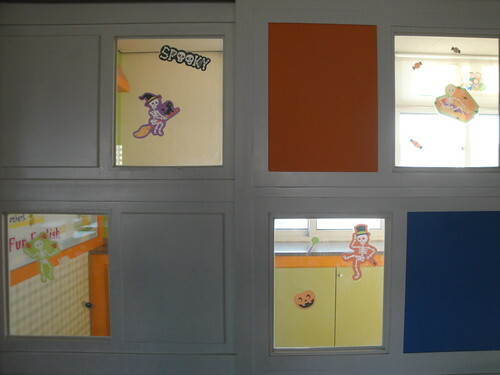 Halloween isn’t really celebrated in Korea, although it seems to be gaining popularity from all the foreign English teachers telling kids about it and throwing parties at school. 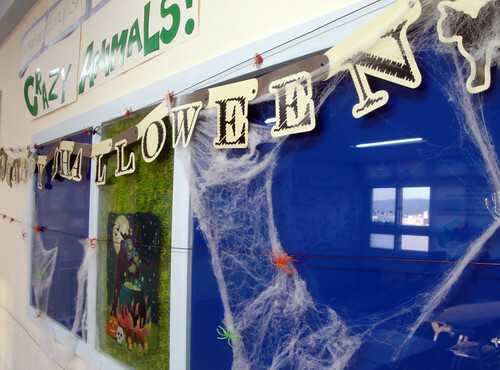 All of the big supermarkets have small Halloween sections with witch hats and devil pitchforks, but it seems most kids don’t dress up unless they have a Halloween party at their private schools. Most of the kids are aware there’s a Halloween-candy connection though, which is all they really care about. 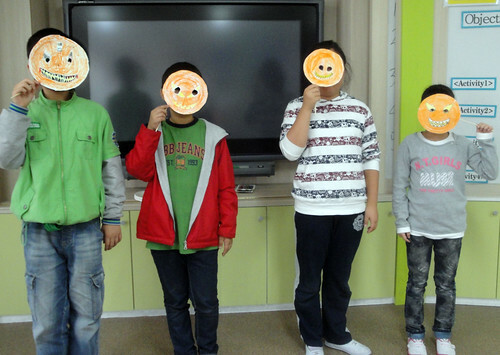 Many of my students came by the English room on Halloween to say, “Teacher! Trick-or-treat! Candy, please!” Haha, nice try kids. 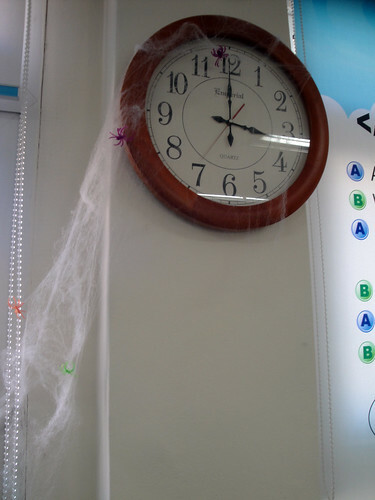 I hadn’t put little plastic spiders in cotton cobwebs in years! It’s pretty fun. 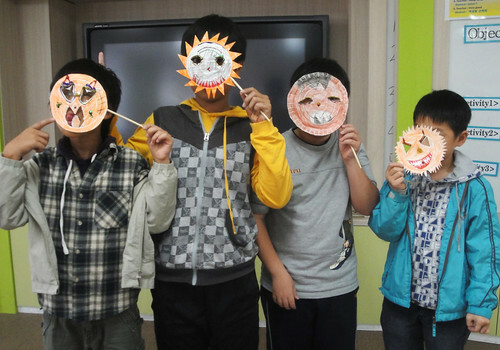 In my weekly “English Cinema” class we watched The Nightmare Before Christmas and made Halloween masks. I was a little worried about whether they’d be into the movie or not, as they don’t really celebrate Halloween or Christmas, but they seemed to like it. Especially the music. The Halloween masks came out pretty cute, and gave me a good use for all the disposable chopsticks I’ve accumulated from over a year of take-out kimbaps and delivery. The best part about teaching in a school is getting to wear my costume there, even if I am the only one. 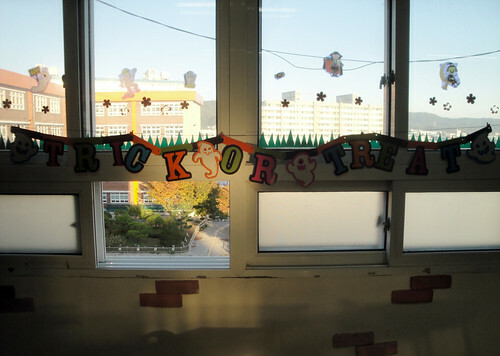 Last year, I had had a rather raucous Halloween exploring downtown Daegu on a bar crawl with mobs of foreigners. This year, I stayed in Ulsan, where there were plenty of parties at the foreigner bars, but nothing quite like Daegu. I was really surprised to find a Korean-hosted party at one of my favorite bars, Showtime, in Ulsan’s old downtown. I was the only foreigner while I was there, and so forced to play the pass-the-paper-mouth-to-mouth game between two ajosshis, but also got a free cocktail. 아싸!